Your new relationship will modify your schedule as you spend time with the new significant person in your life. Use the tips below to maintain your healthy weight loss goals while you pursue your new relationship. Dates often involve food so make some adjustments to how you’re eating. You’ll likely be eating out more in the early days of your new relationship. Weight loss goals are important to you,right? So,introduce the idea early on in your relationship of scrutinizing the types of places you are going to eat . Make sure you get to know the eating habits and exercise style of the person you’re dating. Including the big meal that person eats during the day as well as the time of day the person exercises. It’s important that you acknowledge differences in your styles of eating and exercise. That way as a couple you can decide on incorporating the diet and exercise practices that are important to you. Resist going to exercise together unless you both exercise for similar periods of time. You can each end up being annoyed by the other person. Especially if one person tends to exercise for longer or shorter periods of time than the other. Plan some active outings such as hiking or taking a walk that you’ll both be able to do. Discuss ahead of time whether an after-dinner walk or going dancing is going to be part of your date. If so, each of you can wear footwear that is comfortable for the activity. 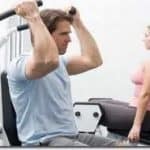 Consider whether your new romance is resulting in a shift in your traditional evening activities such as going out dancing for staying in and watching a movie, a much more inactive lifestyle, and make adjustments to your exercise schedule to accommodate the change in order to maintain your weight loss goals. Encourage discussion and activity that revolves around a healthy lifestyle including your weight-loss goals. Always enlist your new partner’s help in maintaining or further reducing your weight. Similarly, be supportive of your partner’s weight-loss efforts. If you are worried about your diet,don’t pretend that you’re not . Turning down an opportunity to eat out can be viewed as rejection. Unless you communicate that you’re trying to pursue your weight loss goals. Don’t eat to please your new partner or others when they encourage you to try something. Don’t take seconds or choose to eat a food that is not part of your weight loss diet. This seems obvious until you find yourself saying OK to tasting a fattening dessert or other menu item. Decline the food and if you want, explain that you’re watching your weight. A new romance should not mean unnecessary weight gain that defeats your weight loss goals. Use the tips above for pursuing your new romance while keeping your weight loss goals in sight.